Batch cooking is your ticket to creating hot meals in 15-30 minutes. Today I'm showing you how to make Easy Meal Prep Chicken. Let's get to it! Prepare slow cooker: spray with cooking spray or use a crockpot liner for easy clean-up. Remove chicken to platter and shred with 2 forks. Add a little of the broth to the shredded meat, to keep from drying out. See Notes for Storage Instructions. Use a crockpot liner for easy clean-up. One pound of chicken will yield about 3 cups of cooked meat. Cooking times may vary, based on your appliance. REFRIGERATOR STORAGE (use within 1 week): use this option if you will use the chicken within a week. 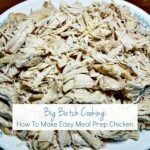 Store shredded chicken in an airtight container. FREEZER STORAGE: Using a permanent marker, label freezer bags with the date, quantity and item (i.e. 2 cups shredded chicken, 10-7-18) before filling. Measure 2 cups of shredded chicken & place in a freezer bag. Remove as much air as possible and seal bag. Allow to cool in the refrigerator for a few hours before moving to the freezer. A FoodSaver works well for freezer storage. For best results use in 2-3 months, although the pre-cooked chicken can be frozen for 6 months.